In Flanders a train of ammunition has been placed at an ammunition refilling point, and after the engine has been detached, and is being run off the train, the second truck suddenly bursts into flames. Sapper (acting Company Sergeant Major) Alfred Henry Furlonger immediately orders Lance Corporal John Edward Bigland, the driver, to move the engine back on to the train for the purpose of pulling away the two trucks nearest the engine. Bigland does so without hesitation, and the engine is coupled up by Furlonger, assisted by Sapper Joseph Collinton Farren, while the burning truck is uncoupled from the remainder of the train by Sapper Thomas Henry Woodman. The two trucks are then drawn away clear of the ammunition dump, it being the intention to uncouple the burning wagon from the engine and the first wagon and so isolate it, with the object of isolating the fire as far away as possible. The uncoupling is about to be done when the ammunition explodes, completely wrecking the engine and both trucks, killing Furlonger, Farren and Sapper George Edward Johnson (a member of the train crew), and seriously wounding Bigland. All five participants are members of the Royal Engineers and all will be awarded the Albert Medal for their actions on this day. British forces east of the River Jordan begin an advance towards the Hedjaz Railway against enemy troops holding the foothills south of Es Salt. By midday cavalry are within two miles of the Turkish post and have taken two hundred sixty prisoners. West of the River Jordan the British line has been advanced at Mezrah, near the Jerusalem-Shechem road. In attacks on the Hedjaz railway near Maan, Arab forces take five hundred prisoners. In Mesopotamia, British forces reach the Tauk River, one hundred forty miles north of Baghdad. British patrols raid the enemy trenches at two places southwest of Canove and south of Asiago, inflicting losses on the garrisons. HMS Coreopsis sinks the German submarine UB-85 in the Irish Sea. The steamer Umba (Master James William Young) is torpedoed and sunk with the loss of twenty of her crew of twenty-five. Her Master is lost at age 57. Captain Roland Churchill Layton (Sherwood Foresters) is killed in Palestine. He is the son of the Reverend William Edward Layton Vicar of Cuddington. Lieutenant Bransby William Goodwin MC (South African Infantry) is killed. He is the son of the Reverend Bransby William Goodwin Rector of Queenstown South Africa. Sergeant Sydney George Giles (London Regiment) is killed in Palestine. His brother was killed last December. Sergeant Douglas John Scott (London Regiment) is also killed in Palestine. He is the last of three brothers who will lose their lives in the Great War all of whom were Sergeants. Private Edward Fordyce (Gordon Highlanders) is killed in action. His brother James was also killed. Private Bertie Frederick Harman (Oxford and Bucks Light Infantry) dies of wounds at age 23. He is the fourth of five brothers who will lose their lives in the second half of the Great War. Trooper Eric Tristram Harper (Canterbury Mounted Rifles) is killed during an artillery bombardment while attempting to quiet horses in Palestine at age 40. 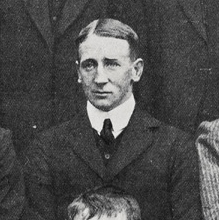 He is notable New Zealand sportsman who played for the New Zealand national rugby union team and in 1905 he became one of the Original All Blacks who toured Great Britain and Ireland. He was also a hurdler and played cricket. He won the first New Zealand national track title in 1901 in the 440 yards hurdles and in 1902 he won the 880 yards hurdles. He was a mountaineer in the Alps who made many discoveries in the Southern Alps. He was the first to the 6,500 ft Denniston Pass in 1908 and had the honour of a creek being named after him. His brother died of wounds in 1916 and they are grandsons of Henry Harper the first Anglican Bishop of Canterbury.